Just returned from lovely Bavaria in Germany, after 3 days photographing the wildlife there. It was evident that snow had fallen hard and it was stacked up to 3 feet in some places. 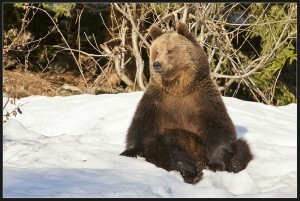 Lucky for us as brown bears in snow was what I wanted to capture. The trip is run by Chris Weston (link to his website on the LINKS page)and the accommodation is a charming Pension/hotel, just minutes from the park. Although the animals are wild, they are used to the presence of humans and so go about their daily business in front of you.